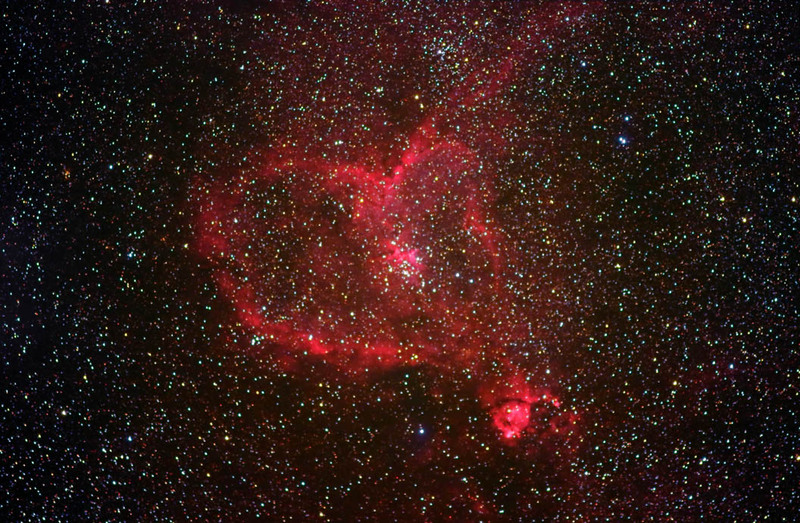 For obvious reasons, IC 1805 (Sh2-190) is commonly known as the Heart Nebula. It lies approximately 7500 light years away in the constellation of Cassiopeia. This is an emission nebula, glowing red due to ionization of the hydrogen by young stars within it. It spans about 200 light years and covers 2.5 degrees of the sky. The predominant cluster of stars at its center is known as Melotte 15. Luminance: 24 @ 5 min. Images were focused using the camera's live view. They were calibrated, aligned, and combined in ImagesPlus. Luninance images were obtained using a Kenko R-64 filter. The color and luminance images were aligned in RegiStar. They were blended and adjusted in Photoshop. Topaz Detail and DeNoise were applied to the final image. Taken from my backyard on 11/6-7/15.